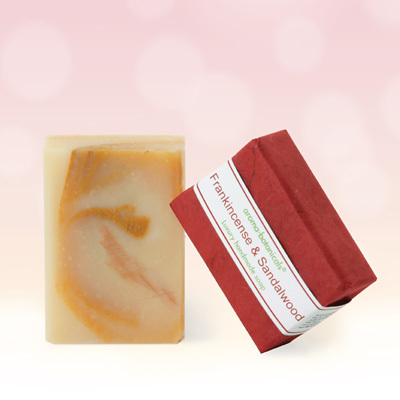 To produce the ultimate luxury cleansing bar, we filled this soap with two of the most rejuvenating and moisturising essential oils known to aromatherapy, and then added the legendary skin-softening power of Shea Butter, known in Africa as 'Woman's Gold';. A heavenly aroma of the finest Frankincense and Sandalwood essential oils soothes the senses whilst the nourishing properties of Coconut and Olive oil delivers the much needed hydration your skin deserves. The luxurious creamy lather of this natural cleansing bar has a silky texture that absolutely seduces and pampers your skin, whilst the alluring fragrance of these two revered aromatic treasures soothes and uplifts the mind, bringing a sense of peace and tranquillity. What more could you ask of a cleansing bar! Possibly the most famous and precious of all aromatic resins, frankincense (Boswellia carterii) has been used for its divine fragrance for over 4,000 years, and was at one time more costly than gold. Today frankincense essential oil is used in aromatherapy for its relaxing and skin rejuvenating properties, which is why we’ve included it in our latest luxury soap. Inexpensive yet luxurious, these sumptuous, creamy cleansing bars make great stocking-fillers for Christmas!